Too much tooth whitening can lead to tooth decay, and if you have been avoiding the sensitivity that you think is caused from the gel you got from your local pharmacy, that pain that you feel when you have your morning coffee could be more serious. That sensitivity could be a cavity. If you have tooth decay, gingivitis or the more serious periodontal disease, endodontic therapy may be required before you whiten your teeth. You can’t improve the appearance of your teeth if you start with a shaky foundation. If you have a toothache that you have been avoiding because you thought it was your tooth whitening product, you may want to think again. Tooth whitening is popular, so popular it is what people seek out first when it comes to cosmetic dentistry. 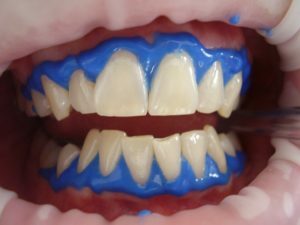 Has Tooth Whitening Always Been Popular? Tooth whitening can be traced back to the day when the ancient Romans relied on goat’s milk and urine to whiten their teeth while the Egyptians mixed a paste made with wine vinegar and ground pumice stone. Physicians in the 12th century recommended a rub using salt and sage. Scrubbing with an Elecampane flower was also popular back in the day. These days it’s easy to whiten your teeth with over the counter tooth gels, polishes, pastes and strips not to mention the tooth whitening mouth rinses that are so popular. However, those over the counter products aren’t as strong as professional whitening products and can be overused. Overuse can cause tooth sensitivity and gum irritation. Previous dental restorations can also be at risk with too much tooth whitening. Too much teeth whitening can also cause your teeth to discolor permanently resulting in a chalky, bluish appearance. According to Advanced Endodontics Beverly Hills over whitening your teeth could weaken the enamel. Soft enamel makes it easy for bacteria and acids to penetrate your teeth. Tooth decay from tooth whitening was unheard of before teeth whitening became a craze. Stop ignoring that pain and make an appointment with your dentist. That ache that has been with you for as long as you can remember, or for as long as you have been using teeth whitening products, may require endodontic therapy. Call and schedule an appointment with your dentist for an endodontic referral today.